Over the last 25 years we have developed an international track record for research in climate, ecosystems and energy and a growing expertise in the fields of food and water. We respond to the challenges in these areas through an interdisciplinary and integrated programme of understanding processes of change; exploring sustainable solutions; and influencing change through education and partnership. We advance understanding of the processes, RISKS and implications of change in coupled human and natural systems. We develop and analyse potential economic and social responses, GOVERNANCE and management practices of relevance to governments, business and communities. 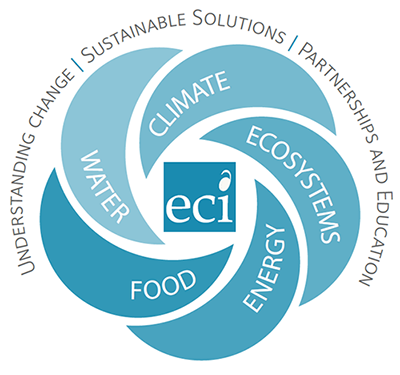 We lead and engage in large national and international consortia on MITIGATION, ADAPTATION and all other aspects of environmental change with research and stakeholder partners. We TRAIN international graduate students in strategic environmental leadership, management and decision-making. We commit significant resources to active ENGAGEMENT with a wide range of key audiences, including dissemination of our research insights. Keep up to date with our news and research by signing up to our monthly newsletter.